Northwestern Engineering’s Ken Forbus has received the inaugural Herbert A. Simon Prize for Advances in Cognitive Systems from the Cognitive Systems Foundation and Herbert Simon Society. Named for Herbert A. Simon, who co-founded the field of artificial intelligence in the late 1950s, the award recognizes scientists who have made important and sustained contributions to human and machine intelligence through design, creation, and study of computational artifacts that exhibit high-level cognition. 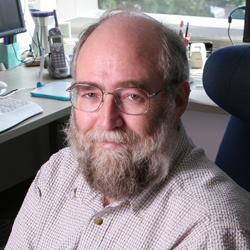 Forbus is specifically honored for his contributions to qualitative reasoning, analogy, sketch understanding, and cognitive architectures, as well as their relationship to human cognition. A $10,000 cash prize accompanies the annual award. An active contributor to artificial intelligence and cognitive science research for more than 30 years, Forbus studies multiple facets of high-level cognition. His research interests include qualitative reasoning, analogical reasoning and learning, spatial reasoning, learning from natural language, and inference engine design. By working in artificial intelligence, Forbus attempts to understand how the human mind works by creating computer programs and simulations. His more recent work includes the development of CogSketch, an artificial intelligence platform that has the ability to solve visual problems and understand sketches in order to give immediate, interactive feedback. Forbus is a fellow of the Association for the Advancement of Artificial Intelligence, the Cognitive Science Society, and the Association for Computing Machinery. He received the Humboldt Research Award from the Alexander von Humboldt Foundation in 2011.